Tom Rockliff has opened up on his time in Brisbane. AFL: Tom Rockliff has opened up on what he described as "probably the worst time” in football. A day after his move to Port Adelaide as a free agent was confirmed, the 27-year-old spoke of the difficult two years as Brisbane Lions skipper in 2015 and 2016. 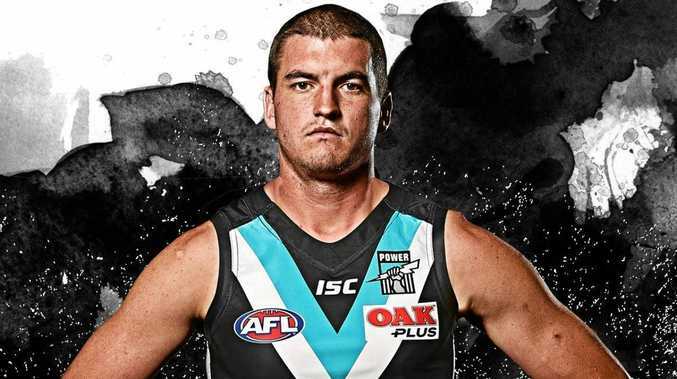 The club finished second last both years with a combined seven wins, culminating in the sacking of head coach Justin Leppitsch and Rockliff being replaced as skipper by Dayne Beams. "I found it really hard to go to the football club and perform my role as captain, be upbeat and try to lead through that really difficult period we went through,” the onballer (pictured), who is yet to play a final, said on NAB AFL Trade Radio. "It was probably the worst time as a footy player. We lost our coach and had so much instability around the place. "Everyone was coming pretty hard for me, which as a leader of the football club you have to expect that, it was just a real challenging time and as I said, you couldn't really escape it at all. While looking forward to starting afresh at the Power, with a four-year deal worth about $650,000 a season, Rockliff enjoyed an outstanding season personally in 2017, under Chris Fagan. The Lions now have No.1, 12, 18 and 19 in next month's draft, and will look to use one of them in bargaining with Adelaide for Queenslander Charlie Cameron.